My posting has been rubbish……. My last post was ages ago, I think May following the NDW50/Richmond Park Marathon effort. Suffice to say I need to start posting more and actually write some of the gear reviews that I had planned as well as race reviews. The good news is my training has really picked up over the last few weeks as well as me loosing about 2 kilos of weight, meaning that running and cycling is getting easier meaning I can run and cycle more! The last two weeks is where it has really slotted into place, with 35 mile week of running and 62 miles of cycling followed by a 43 mile week of running and 51 miles of cycling. As recovery goes I don’t think it was the Fan Dance that knocked me off training for a week. The day after I woke up and felt terrible, snotty and achy, all the obvious signs of a cold. There had been some colds going around work and my wife and kids had a cold the previous week, I think that I was so determined to not get sick because of the Fan Dance that the day after my body said “right, you can get sick now” and so I proceeded to be wiped out for a few days. Even though my legs felt fine I didn’t have the energy so I took the opportunity to wake up a bit later in the mornings. I finally got back to the gym on Friday and then went for run around Box Hill on the Saturday with Gareth. It was pretty muddy out there so was slow going but it was good to be back running without a small house on my back and I am looking forward to start to pick up my mileage building up to the weekend of the 17th and 18th of May. 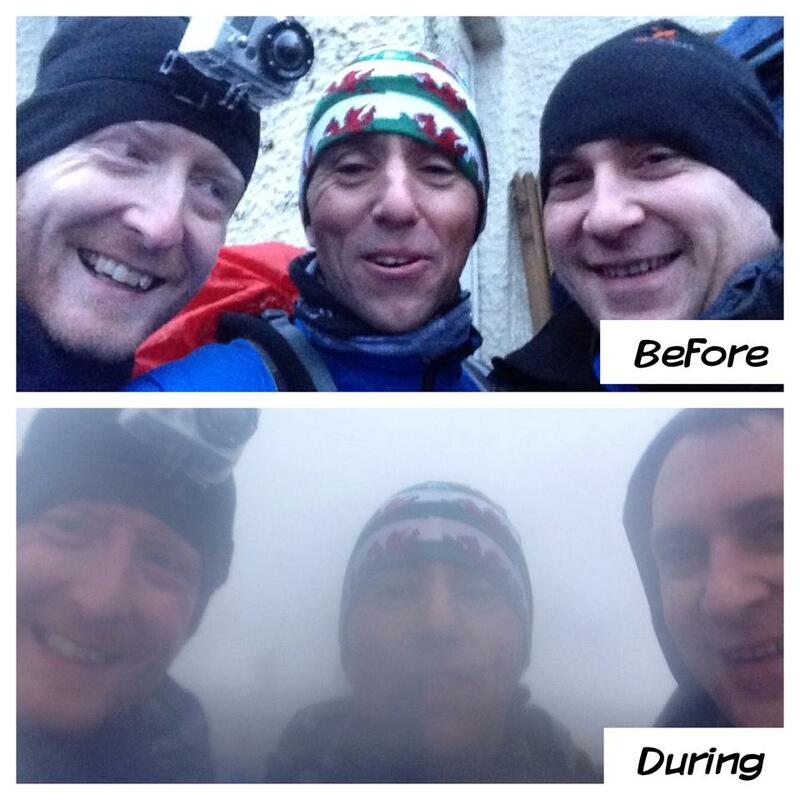 On January 18th 2014 I and two other guys (Gareth and Simon) partook in one of the most gruelling challenges that I have done to date. This infamous route has long been a part of SAS (Special Air Service) and SBS (Special Boat Service) Selection and is considered the yardstick of a candidate’s potential to perform well on Test Week and ultimately pass the Special Forces Selection programme. 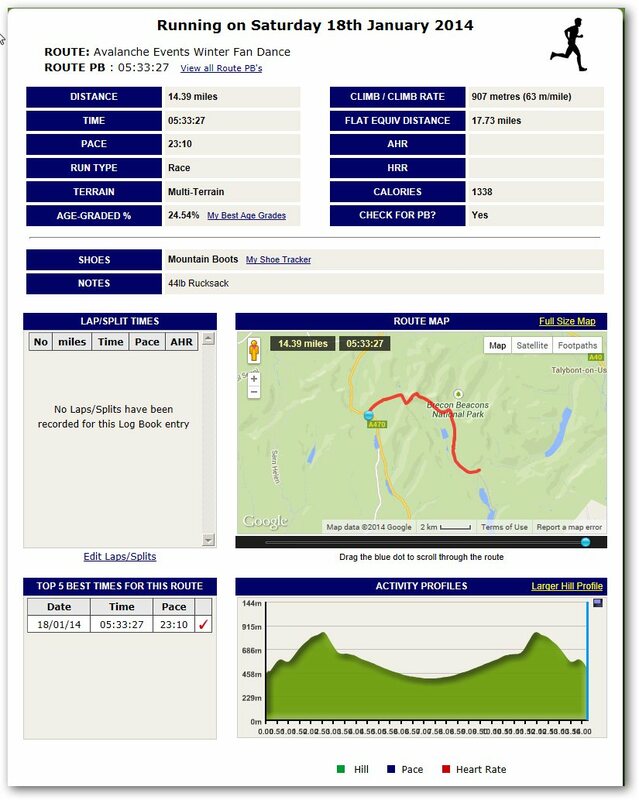 Starting at the Storey Arm’s car park, the race goes straight up to the summit checkpoint of Pen Y Fan and, after descending ‘Jacob’s Ladder’, continues along an undulating stone vehicle track (the ‘Roman Road’) to the second checkpoint which also serves as a tea stop and turnaround point. Then, taking the route in reverse, racers climb back up “The Fan” via Jacob’s ladder and pass through the summit checkpoint a second time before legging their way back down to the finish at the Storey Arm’s car park. Quite an appealing description and the opportunity to even have a small taste of what is involved in selection was something not to be missed, I am pleased to say that the day didn’t disappoint. Arriving at the Storey Arms for race registration (after a quick breakfast on the go) we collected our race number and map. It appeared that due to the severity of the weather the route had been amended slightly so we missed out Corn Du. Clearly although it was grim down at the base of the mountain the conditions were far worse up top. As we were doing the load bearing event (for authenticity) we had to go and get our rucksack’s weighed to make sure that we met the minimum required weight. I had weighed it the night before and was certain that it was above but I was a little nervous that for whatever reason it would be under and I really didn’t fancy trying to get more weight in. As it was my bag was 44lb (19 kg) so 10lb over the necessary weight. I was told I could drop some weight out but I really didn’t want to mess with my pack so just stuck with it. After the race briefing, which being at the back we didn’t hear much (other than the word treacherous, that got through) we set off. I and Gareth had opted to start out with poles, I previously had severely sprained my ankle and it now is pretty weak and over the rough terrain with the added weight I didn’t want to risk a repeat of it. The first two miles is pretty much all up and the weather was already making it tough going, the rain had started and the wind was picking up. 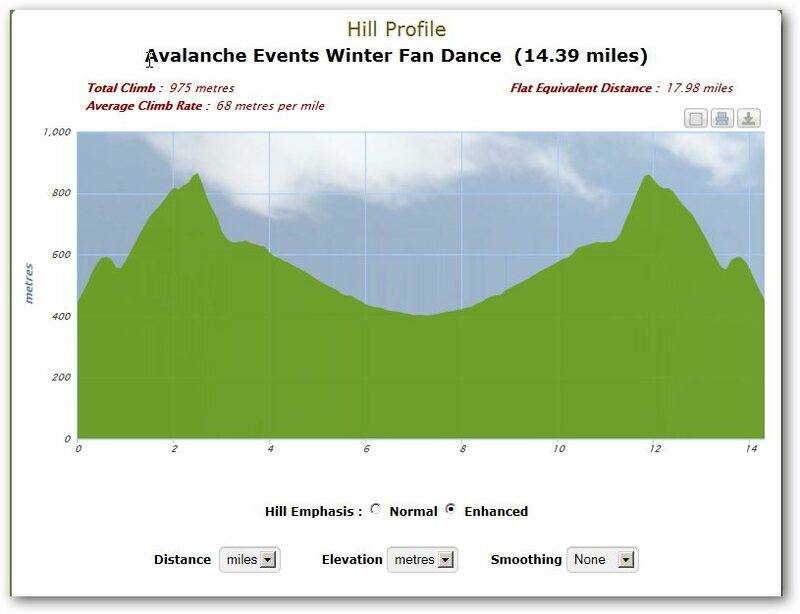 We had already done part of the route on a training run but the conditions were far better, so although we knew what we were in for we weren’t prepared for how different the mountain was going to treat us. I had decided to try to record as much of the event as I could on my GoPro and managed to capture a clip of us as we were just about to summit Pen Y Fan, at this point we had already taken the alternate route cutting out Corn Du and had been shielded from the full strength of the wind up to this point. From the top of Pen Y Fan to Windy Gap (how appropriate), the wind was totally unrelenting and was c. Checking in at the RV1 we then headed down the Roman road. It was a gentle descent so we tried to pick up the pace, me folding my poles up. About 100 yards later I had twisted my right ankle so the poles came back out and the pace slowed again. The rain continued and although my torso was remaining dry everything else was soaked through. Getting to RV2 it was an opportunity for a quick loo break and then back off the way we had come. Starting up again it became I had pushed my GoreTex boots to the limit and they had let in water, the problem is that once its in there is nowhere for it to go so I had to resign myself to the fact that I would be walking in a permanent puddle for the 7 miles back. Coming back up the Roman Road with its gradual incline wasn’t too taxing but the mood was low. The weather was taking its toll more than the terrain, there was no respite from the wind and rain and this was causing us to really start feeling the cold. Checking in at RV3 at Windy Gap before the start of the climb up Jacobs Ladder any plans for a quick time were out the window and it was about getting back safely and in one piece. We paused while Gareth attempted to fix it but he wasn’t having any joy, the cold was making things very tough and I think it was affecting us more than we realised. After another failed attempt he threw it to the ground in frustration and said to leave it. I decided to have a go at sorting it as he had only bought them a couple of days before. It was while I was messing around with the pole (and eventually fixing) that Gareth said he was getting really cold and needed to put a warmer jacket on. This was quite a task as the cold had meant our hands were barely functioning so it was a team effort to get his bag off and jacket on. He later said that he had stopped shivering at this point which is not a good sign, if he hadn’t of packed that extra jacket things could have gone south very quickly. Once he was sorted we set off again, this was a good thing as the cold had started to get to me, I could no longer feel my hands at all and I could see frost forming on the outside of my gloves. We were moving comparatively slow but as it has been in other hilly events in the past the hills are a strength and we were still catching and passing others, usually with one of us checking if the person we were passing was ok.
Getting up over Jacob’s Ladder was a big milestone, as it was (nearly) all downhill from there onwards Meeting up with Simon we headed down Pen Y Fan battling on. My feet were now starting to really feel soggy and I was getting worried that when I took my boots off I would be presented with something horrific, but I had to put that to the back of my mind and press on. Gareth had started to get warmer as we lost altitude and the wind had eased off so spirits were starting to lift. The pace was steady as we continued towards the red phone box with each step bringing us a little closer. Crossing that line and receiving the finishers patch I felt a great sense of achievement, it had been a war of attrition and we had succeeded. I have to, I need snow! In all seriousness I probably will do, we are already thinking of doing the summer Fan Dance, albeit clean fatigue and I would like to experience a winter ‘dance’ with snow if possible. 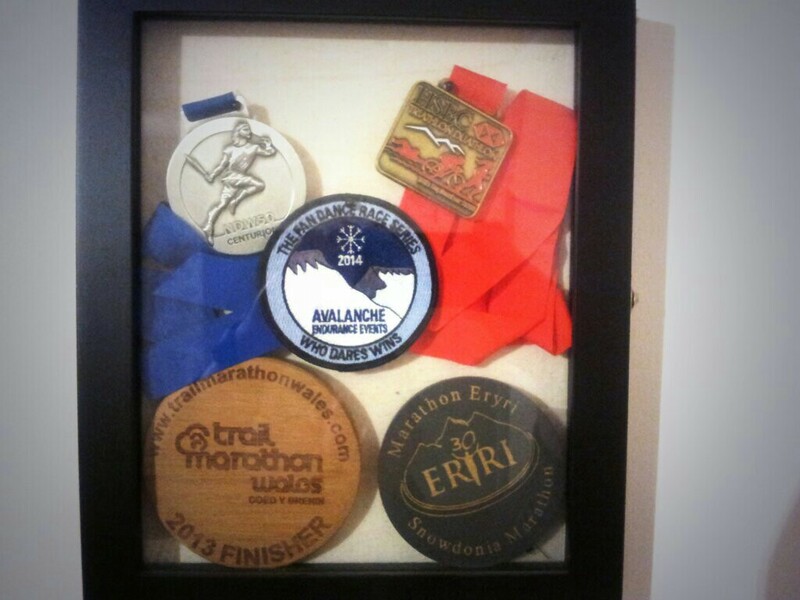 Avalanche Events offered up a really good experience, great organisation and authenticity. The Fan Dance has a huge amount of mythos surrounding it and to capture a small element of the experience is something very special indeed. I would definitely recommend this to anyone who is looking for a challenge and experience, summer or winter, clean fatigue or loaded, either way you are in for a treat! My review of the Winter Fan Dance is coming, just trying to get everything down in words, edit my footage as well as getting over a cold. Kit wise I am happy, trying to pack a rucksack out to hit the necessary minimum weight is quite a challenge (especially as up until now its always been about reducing weight) but I think I have got it nailed. I actually took a punt last Thursday and bought some new walking boots that were on sale and too good a bargain to miss out on, I know it’s not never a good idea to use new kit but I managed a morning training hike around Box Hill and they performed really well.